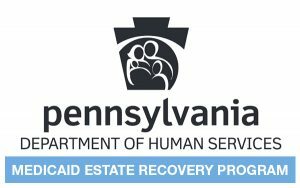 If the Pennsylvania Department of Human Services (DHS) provides medical assistance to an individual who is over 55 years of age, DHS shall have a claim against that person’s estate to recover the cost of the medical assistance. DHS’s claim against the decedent’s estate includes the cost of nursing home care, home and community based services, prescription drug services and certain hospital expenses. All of the decedent’s estate property is subject to DHS’s claim, as well as life insurance that is payable to the decedent’s estate. Written documentation regarding the gross value of the decedent’s estate. If the request for a statement of claim contains all of the required information, DHS must provide its statement of claim to the personal representative within 45 days or it may be forfeited. What if the DHS Claim Exceeds the Value of the Decedent’s Estate? In many cases, DHS’s claim exceeds the value of the decedent’s estate. If the estate’s assets are insufficient to pay all claims, the personal representative must pay the estate’s claims in the following order: (1) the costs of estate administration (reasonable attorneys’ fees and personal representative commission); (2) the family exemption (up to $3,500); (3) the costs of decedent’s funeral and burial and the costs of medical care, including medical assistance, provided to the decedent in the six months immediately prior to the decedent’s date of death; (4) the cost of a grave maker; (5) rents for the occupancy of the decedent’s residence in the six months prior to his death; (5.1) all claims by the Commonwealth of Pennsylvania, including the remainder of DHS’s claim for reimbursement of medical assistance provided to the decedent prior to the six months before his date of death; and (6) all other claims. When Can DHS Postpone a Claim to Recover the Cost of the Medical Assistance from an Estate? There are certain limited circumstances where the DHS may either postpone the recovery of its claim or waive its claim if it would cause an undue hardship on the estate. For example, DHS may postpone the recovery of its claim until the death of a surviving spouse or any child that is blind or totally and permanently disabled. In the case of postponement, the personal representative must “protect” DHS’s claim and the estate’s assets by causing a lien to be placed on the property in favor of DHS. Can a Personal Representative be held Personally Liable for the Payment of DHS’s Claim? If the personal representative of a decedent’s estate either fails to obtain the statement of claim from DHS or fails to pay DHS’s claim in the proper priority, the personal representative shall be held personally liable to pay the claim. Therefore, it is highly recommended that any personal representative of the estate of a decedent that received medical assistance immediately engage an experienced estate attorney to assist with handling these matters.